This report is the first ICT industry publication designed for city decision makers including CTOs, CIOs and technology advisors that provides an overview of the network-enabled technologies to have the greatest impact on the evolving Smart City. 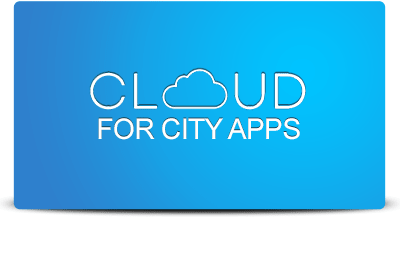 Developed by the Alliance for Telecommunications Industry Solutions (ATIS), it aims to help city planners know what’s on the horizon for tomorrow so that they can start developing their technology vision today. The 5G network, augmented reality, machine learning and other innovations are delivering a wealth of options to rapidly advance the power of Smart Cities technology. 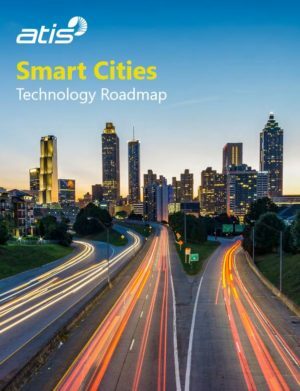 The Smart Cities Technology Roadmap helps city planners know what’s on the horizon for tomorrow so that they can start developing their technology vision today. The report is developed by the Alliance for Telecommunications Industry Solutions (ATIS), an organization that brings together the top global information and communication technology (ICT) companies. Rapidly advancing capabilities to collect and analyze constant real-time data are starting to help better manage many citizen-centric functions, improving traffic flow monitoring, public safety, and more. […] This Roadmap is a much-needed focal point for dialogue between city planners and the ICT industry. It can enable planners to turn their Smart Cities projects into a comprehensive Smart Cities vision. – Section 2 provides an overview of Smart Cities challenges and benefits, based on outreach to city leaders and the industry. summary of key technology enablers for the broader audience. choices and an assessment of critical factors that may impact future deployment. – Section 5 provides a focused assessment of each Application sector, and how it will be impacted by the various technology developments and enablers. 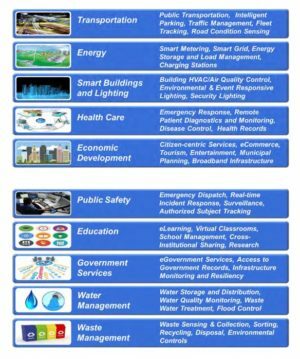 Smart Cities application sectors. Source: Report. – Section 6 provides an example industry reference regarding level of uncertainty (and risk), through public and private partnerships. – Finally, Section 7 delivers an overall set of conclusions, and identifies the next steps for this ATIS collaborative initiative.